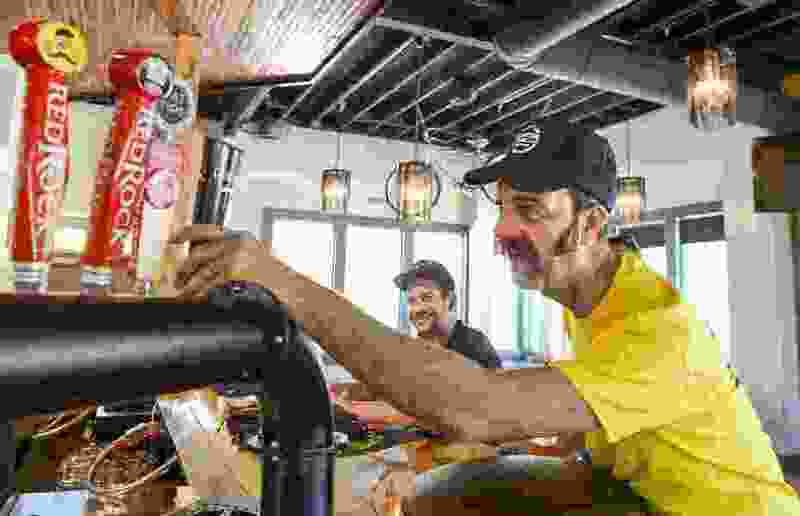 (Leah Hogsten | The Salt Lake Tribune) HandleBar co-owner David Morris draws a laugh from bar manager Ryan Stapley, left, as he tests the placement of a Guinness beer tap back in June. The bar now is boycotting Red Rock over comments made during a legislative hearing. For more than two weeks, owners of at least a dozen Utah bars have been staging a beer boycott — refusing to sell products made by Salt Lake City’s Red Rock Brewing Co. This craft beer brawl stems from comments made during a March 6 legislative hearing on SB132 — the proposal that would allow higher-alcohol beer in grocery and convenience stores. Red Rock founder Bob Jensen — who was one of several brewery owners opposing the measure — told a Utah House committee that increasing the state alcohol limit on beer from 3.2 percent by weight to a then-proposed 4.8 percent would make it “very easy” for adults and underage drinkers to overconsume. The committee gutted the bill and replaced it with one that would create a task force to study the proposal. On the final day of the 2019 session, however, lawmakers passed a compromise bill that raised the alcohol content on retail beer to 4 percent by weight (or 5 percent by volume, a more common industry standard). If the bill is signed into law by Gov. Gary Herbert — which is expected — it will take effect Nov. 1 and mark the end of an 86-year-old law that had been on the books since before Prohibition. Morris said between the five businesses he sold thousands of dollars worth of Red Rock’s beer on draft each month; and thousands more in higher-alcohol beer available in bottles. Other bars have since joined in the boycott, including Whiskey Street, Bourbon House, White Horse, Green Pig Pub, Lucky 13 and Cheers to You. Jensen said Friday that he wishes he’d never made the statements. Jensen said he was frustrated with SB132 as it was originally written. “I didn’t like the fact that not a single brewery was invited to help with the language of the bill,” he said. “It changed one number. It’s like changing the legal driving age to 18 without thinking about the ramifications." In recent months, alcohol shifts in other states have caused Utah’s 3.2 beer selection to evaporate. New laws took effect in Oklahoma and Colorado that allowed stronger beer to be sold in grocery stores. Kansas is not far behind; it will allow full-strength beer in stores April 1. Large companies, such as Anheuser-Busch and MillerCoors, have said that it’s not worth brewing lighter beer for such a small market. Small-business owners, Utah grocery and convenience stores, beer distributors and some brewers pushed to boost the alcohol limit so consumer selection is maintained. But Utah brewers have been divided on whether an increase was needed. Some brewers such as Red Rock, Epic, Uinta and Squatters were against the original measure, arguing they could step in and fill the gap, while other, mostly smaller, brewers, welcomed the boost. Despite the “internal and external problems” that his statements to the committee have sparked, Jensen said he is willing to work with brewers, bar owners and others to develop better legislation in the future. Correction: This story was update Sunday, March 24, at 3 p.m. It now includes a correct quote from Bob Jensen; and updated beer sales information.